The Town of Hopkinton for permission to work on the Stevens Rail Trail section. The owners of Knoxland Equipment for permission to cross their property. The owners of Nicom Coatings for permission to cross their property. 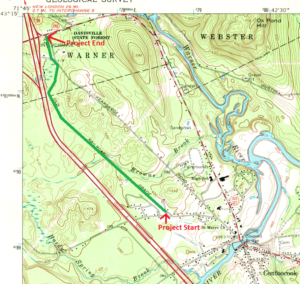 NH Forests and Lands for permission to use the edge of the Davisville State Forest. 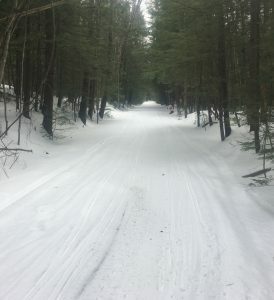 Funding for this project comes from a combination of individual donations and a Recreational Trails Program grant from the NH Bureau of Trails. The Davisville sections of this project have been an active snowmobile trail for years. But that portion was not suitable for pedestrian and cycling in the summer months. 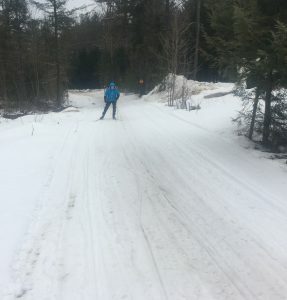 This project will create a smooth trail with a stone dust surface so users of the Stevens Rail Trail will have a way to reach Route 103 and destinations like Knoxland, Cyr Lumber, the Schoolhouse Cafe, Madgetch, the Davisville Flea Market, RR Charlebois and more. Project status: Work began in early December 2018 with the Davisville section of the trail being staked out and brush cut. Silt fencing was installed where required. Our contractor, Hopkinton Forestry and Land Clearing, boxed out the trail through to the end of the Stevens Rail Trail, organic material was removed and bank run gravel brought in to establish a base. Culverts were installed as specified on the plans. Then the weather shut down work for the winter. Once we can get back in the ditching in a couple of areas of the railroad grade will be cleared, material brought in to ensure a good base in a couple of spots, and a top coat of 3/8″ minus stone dust will be spread and compacted. We are still accepting donations for this trail segment. 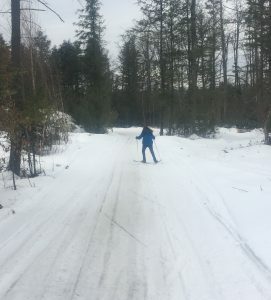 This skier is getting in a quick run before the snow’s all gone on the new section of trail in Davisville.